20 cm xiv, 296 p.
Reprint. Originally published: London: Methuen, 1981. In this ground-breaking and influential study Fredric Jameson explores the complex place and function of literature within culture. At the time Jameson was actually writing the book, in the mid to late seventies, there was a major reaction against deconstruction and poststructuralism. 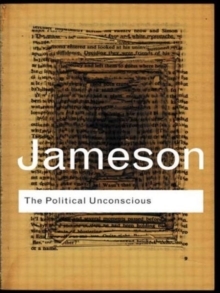 As one of the most significant literary theorists, Jameson found himself in the unenviable position of wanting to defend his intellectual past yet keep an eye on the future. With this book he carried it off beautifully. A landmark publication, The Political Unconscious takes its place as one of the most meaningful works of the twentieth century.